So, yes, I am still painting my squads, but real life work has kicked into high gear for me so I apologize for the late post. 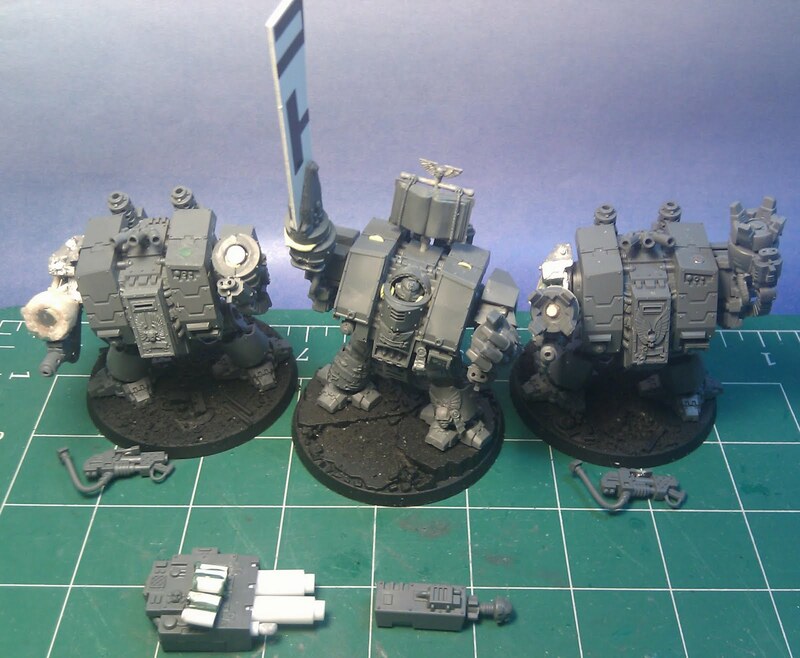 In between the few rare sittings I have had to paint, I have been working on my dreadnoughts. Some of you can remember my last set of dreads, my Heavy Support TLAC dreads. 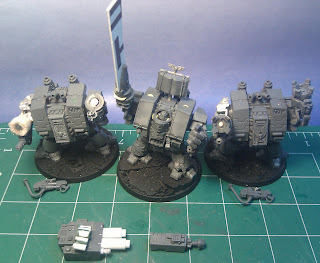 This week I worked on Two Furioso Dreads and one Librarian Dread. Here are the results, with still some work to be done. As most of the fellow BA or successor chapter players have learned, making the Furiosos now a days without the old pewter kit available on the shelves, has become a huge pain in the neck. 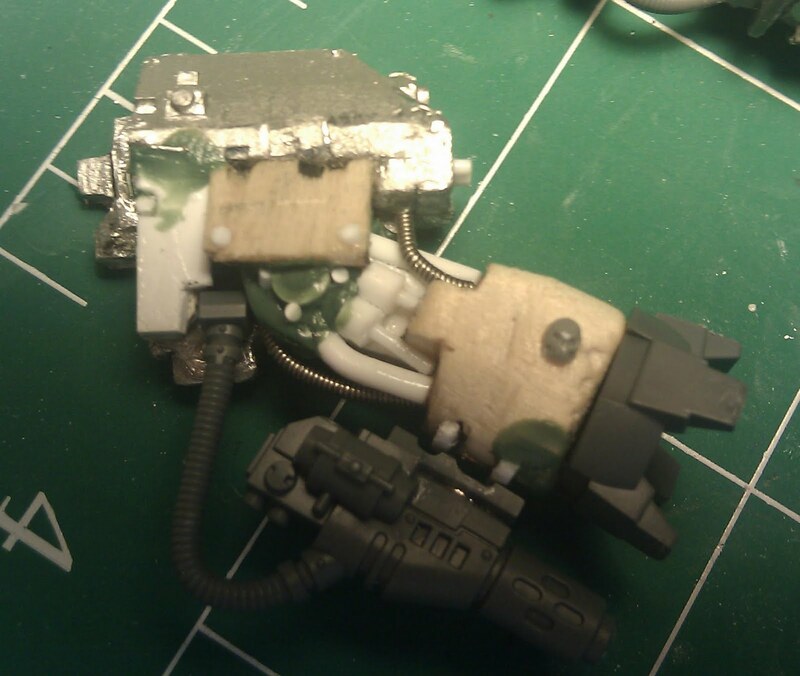 With hopes that there will be new kits or options for that infamous right arm, and blood claw options, many people have gone to more fun and unique arm solutions. I fall into that category. 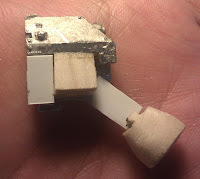 I am using the Ironclad dreadnought kit for my arm and chassis, but without wanting to buy tons of kits, 40 some bucks a pop, or buying just the bits around 9-15 bucks a pop on eBay, I decided to try my hand at scratch building. With left over wooden dowel material and some plasticard and plastic rod, i began to see what I could come up with. Of course, as I am a glutton for punishment, I had old pewter Assault Cannon arms to work with as a base. With plenty of sawing and cutting I bent the pewter to my will. With the hard part out of the way, I finally glued them in place and began to add all kinds of detail bits. Rods, Pistons, Rivets, and cables. Completed basic arms after assembly. Now of course, I have a soft spot for magnetizing so I magnetized my arm options as the choices are Storm Bolter, Meltagun, and Flamer. 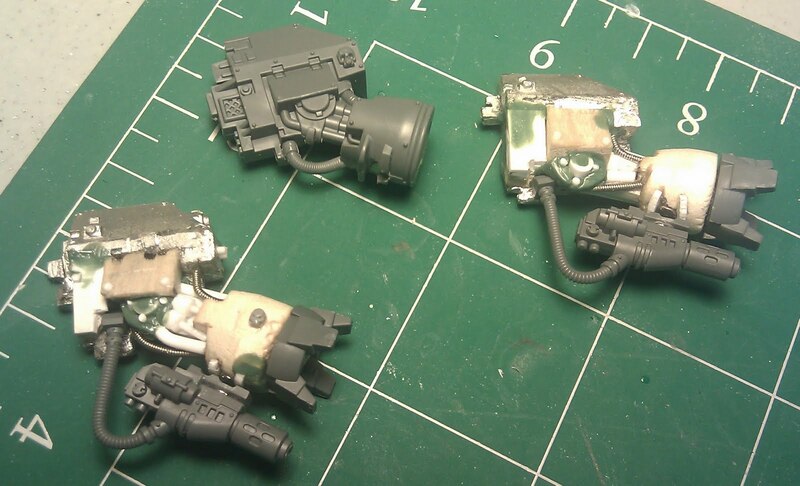 After magnetizing the weapons and fists, I greenstuffed the joints and finished them off. 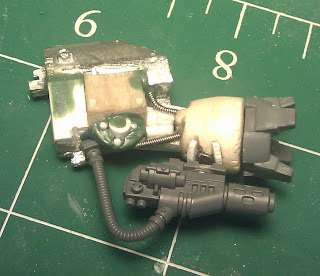 Completed with greenstuff and magnetized fist. So all told, I was very happy with how the two extra fists came out, with one from GW as a sample, I feel the extra Furioso fists will work out well. As you can see my Libby has a huge Plasticard sheet which will be built up and modeled into the Librarian Force Weapon. 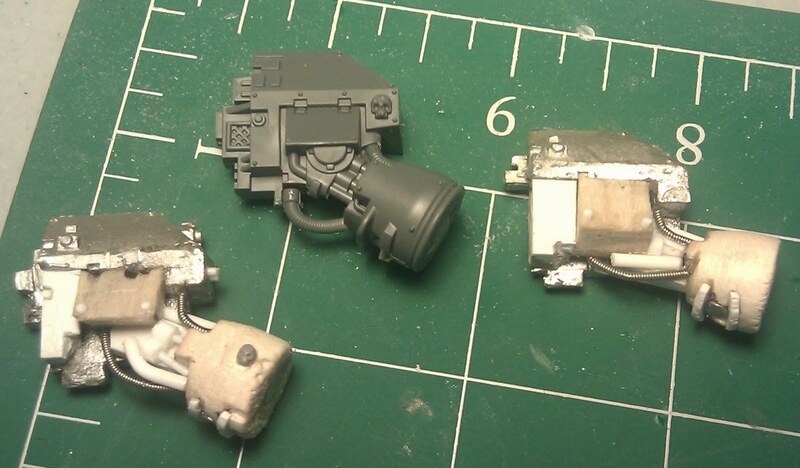 You may also notice that I made a prototype Frag Cannon and a Magna Grapple. Additionally, I feel that I am done with my HS dreads, complete with plenty of weapon options. I am stil lacking the two DC Dreads I plan to have for my army, and will probably keep to my IC conversion tricks for those as well. 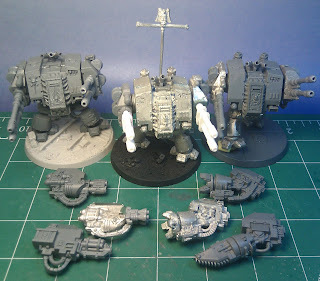 So, any other Blood Angel players out there work on their Dreadnoughts, Furioso or otherwise?